ABC has made great strives in adding diversity to their programming in recent years, with comedy shows like Modern Family, Black-ish and Fresh Off the Boat. 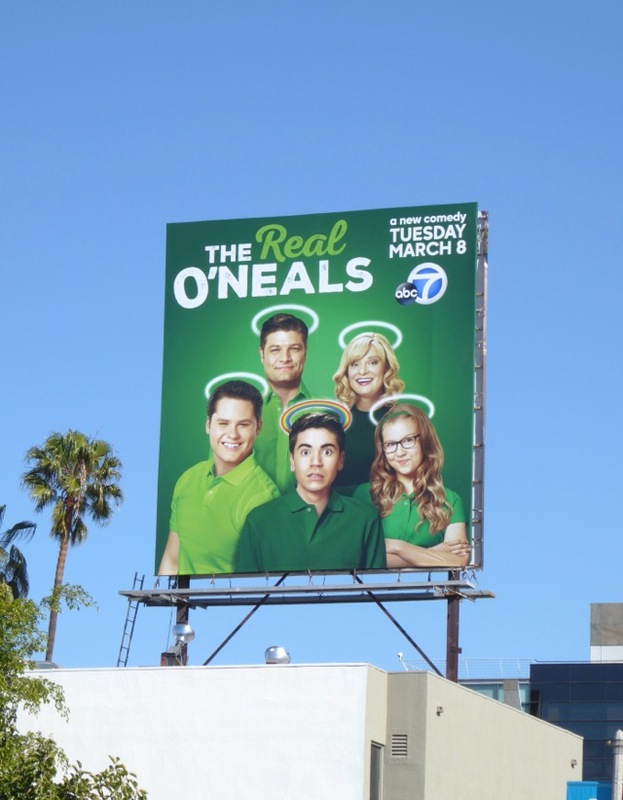 Now they're trying to continue that trend with their new sitcom, The Real O'Neals. The show features a Chicago-based Irish Catholic family who may not be as perfect and angelic as they at first appear. 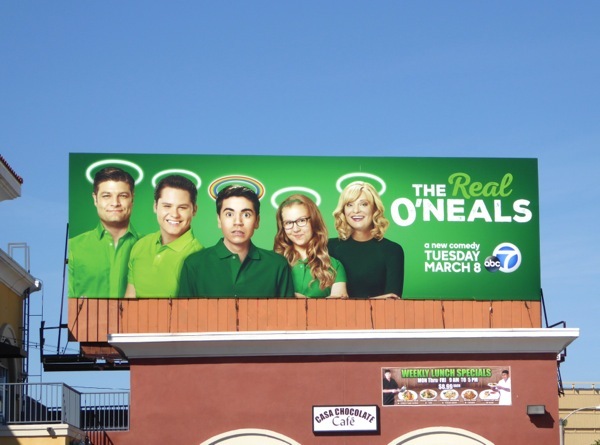 Their youngest son and middle child, 'Kenny' (played by Noah Galvin), is 16-years-old and ready to come out of the closet (hence the rainbow halo on the ad creative), his older brother 'Jimmy' (Matt Shively) has developed an eating disorder in order to make the school wrestling team, whilst his younger sister 'Shannon' (The New Normal's Bebe Wood) is pocketing charitable donations meant for kids in Africa for her own ends. Meanwhile his parents played by Raising Hope's Martha Plimpton and Jay Ferguson are getting a divorce. 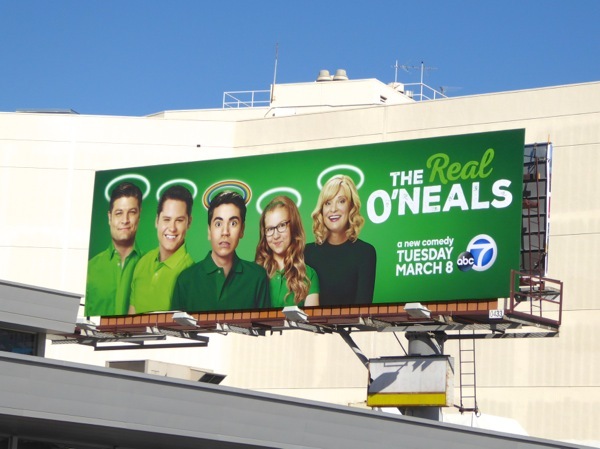 These eye-catching green sitcom launch billboards were first spied along Pico Boulevard on February 5, then snapped along the Sunset Strip and Beverly Boulevard though February 24, 2016. 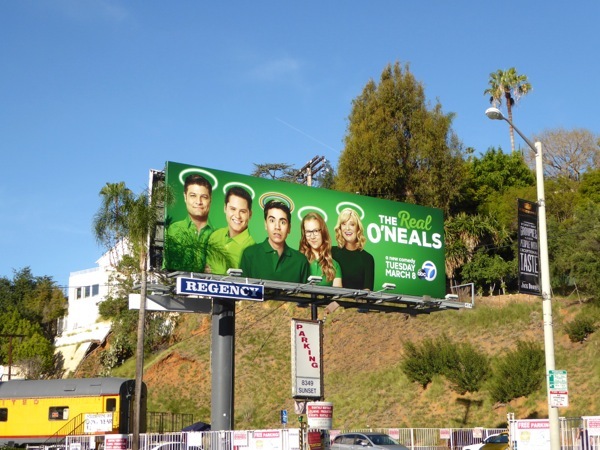 Be sure to also enjoy these TV billboards for The New Normal and this Raising Hope sitcom billboard. 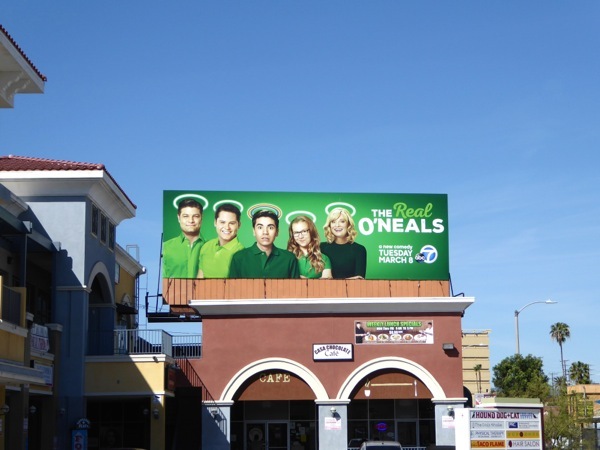 Plus if this premise sounds familiar, you may also want to check out these billboards for The McCarthy's, a short-lived CBS sitcom which featured a Bostonian Irish Catholic family with a grown up gay son. Family sitcoms seem to be a real staple of network television each season, but sometimes levity is a great way to help discuss and educate audiences on issues that may be sensitive, or not openly talked about in some families, in a fun and engaging way.